If you’ve experience the number of rains that we have in New Brunswick, you are probably seeing plenty of crabgrass. Weather conditions have been ideal for crabgrass in many areas of the state. You may be asking what can be done to clean-up this weed problem and reduce the impact on renovation practices that you may want to implement at this time of the year. If the infested area is small and you want to avoid using a pesticide, you pull out the crabgrass with a crabgrass rake. 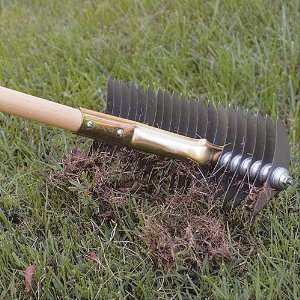 Use a crabgrass rake to remove infestations of crabgrass in small areas. A crabgrass rake is impractical for large areas but there is one herbicide that can kill large plants at this time of year. Avoid the use of quinclorac on moderately tolerant turfgrasses unless you are willing to closely follow the precautions described on the label. Moderately tolerant cool-season turfgrasses include creeping bentgrass, rough bluegrass (Poa trivialis), fine fescues (Chewings, hard, and creeping red fescues). 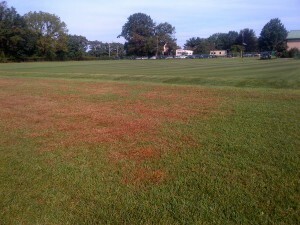 Seaside and Colonial bentgrasses are susceptible to quinclorac and should not be treated with quinclorac. Brown vegetation in this image is crabgrass growing in a tall fescue-Kentucky bluegrass turf 7 days after treatment with quinclorac. Image taken 5 Sept. 2013.